THE GALAXY NOTE 4 was announced during Samsung’s IFA press conference, with the phablet looking to challenge the LG G3 and Apple’s 5.5in iPhone 6 Plus. The Galaxy Note 4 arrives boasting a 5.7in QHD screen, complete with a 2560×1440 resolution, besting the HD 1080p display on last year’s model. Under the bonnet, the Korean version of the Galaxy Note 4 will pack Samsung’s octa-core Exynos chip. However, for the rest of the world it will feature a quad-core 2.7GHz Qualcomm Snapdragon 805 chip, paired with 3GB of RAM and support for Cat 6 LTE speeds. 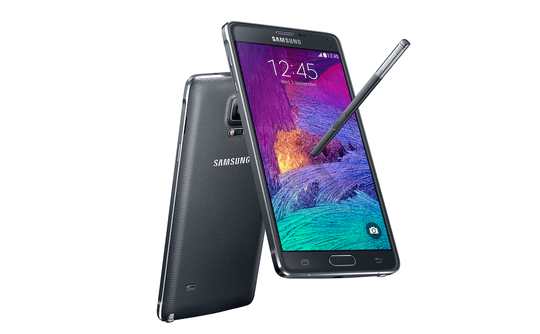 The Galaxy Note 4 design is largely similar to last year’s model. It retains retains the soft textured back of last year’s Galaxy Note 3, but boasts a Galaxy Alpha-style solid metal frame. This makes the handset slightly heavier than last year’s model, measuring 8.5mm thick and weighing 176g. As expected, the smartphone runs Google’s Android 4.4 Kitkat mobile operating system, and features the same UX found on the Galaxy S5. Samsung has made some tweaks to the interface however, introducing transparent widgets, dual-screen multitasking improvements and a refreshed S Health app. Samsung’s S Pen has seen an improvement too, and the firm claims it now closely mimics an “analogue” pen. The stylus has been enhanced with 2,048 pressure points in order to replicate a typical pen, and there’s also the option to write with a calligraphy pen or fountain pen. The Galaxy Note 4 features a 16MP camera, the same as the Galaxy S5, complete with optical image stabilisation and the ability to shoot 4K video. There’s also a 3.7MP camera on the front of the phone, while the handset’s heart rate sensor can act as a shutter release for talking selfies. The handset also features a 3,200mAh battery complete with the same Power Saving mode found on the Galaxy S5, and a fingeprint scanner built into its home button.